Yesterday, me, my mum, my baby brother and my dad went to the red kite centre at Argaty. 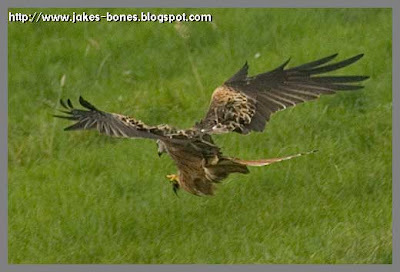 I like red kites because there are a few nests near my village, but I'm not allowed to say where. 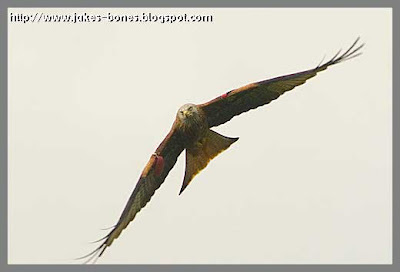 In one of my favourite woods you can go and see a pair of red kites flying about and I love watching them. At the red kite centre at Argaty, you can go and watch the red kites being fed. They only give them a tiny bit of food to make sure the red kites are finding food for themselves. 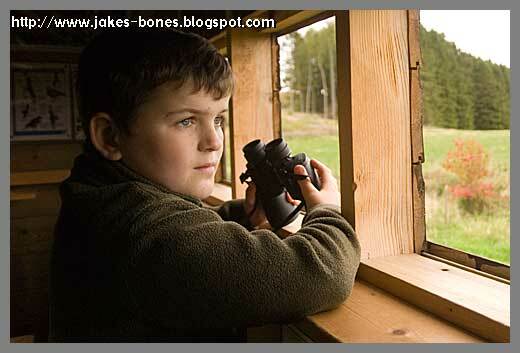 The food they put out is from rabbits and deer, cut into tiny pieces. At 2.30pm we arrived and walked up to a hide, which is like a big shed with lots of flaps on every side where you can sit and watch the birds. They put the food out at about 3pm and then loads of red kites came to feed. The red kites didn't land on the ground, but swoop down and catch the meat with their claws without stopping. 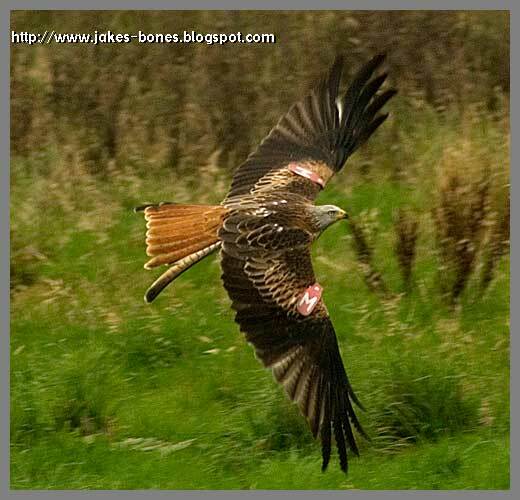 Red kites are rare in Scotland. There used to be loads, but they got killed by shepherds and gamekeepers because they were thought to kill lambs. The shepherds thought this because red kites line their nests with lambs wool. The red kites don't really kill any other animals, because they feed on the bodies of animals that buzzards kill. Now there are 150 pairs in Scotland, and this year they had 93 chicks, which sounds like a lot but you'd need to have about 900 to have a proper population of red kites. Red kites are a protected species because they are so rare. 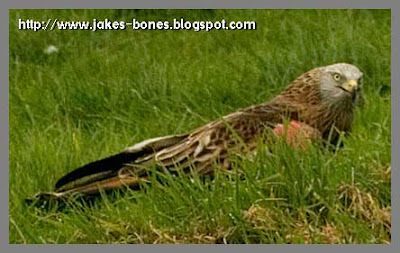 Last year, one red kite got shot in my village but luckily it managed to stay alive. 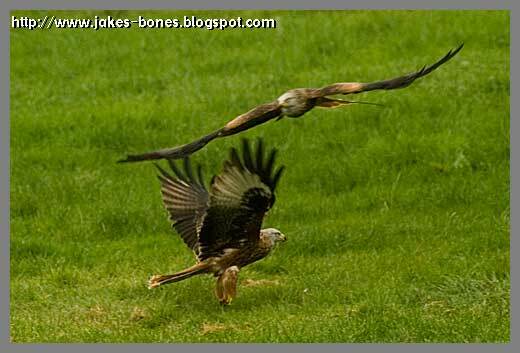 There was so many red kites that it looked that they might crash into one another but none did. They are brilliant at flying and very manoeuverable in the air. Red kites have huge wings, much bigger than the ill buzzard I found last week. All the way across, they are bigger than me! Some wings can be over 2 metres across which is even bigger than my dad ! I think in Scotland only the golden eagle and white-tailed eagles have bigger wings. Red kites have tags on their wings to tell them apart. When they are chicks someone brave has to climb into the nest and fasten the tags on the wings. I wouldn't like to be that person ! The tags help experts and people like the RSPB to tell which bird is which. The tag on the left wings is where it was born, and the red kite two pictures above has a red left tag so it was born in Central Scotland. The tag on the right wing is the year it was born, and this one is red again, so it was born in 2003. 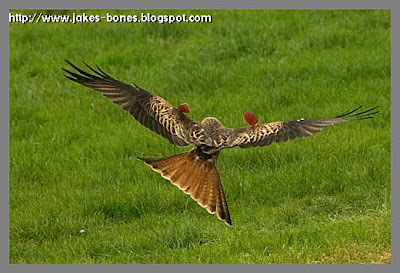 The red kites nearest to my house are the female is red/purple and the male is red/green. You can find out what all the tags mean here. At the end, there was one red kite that actually landed, but it didn't stay there for long. They feed the kites every day at Argaty and it costs £2 for kids and £4 for grown ups but it is definitely well worth it.